As many as eight Middle East universities will be competing to build cars using only chemical components at the first Middle East Regional Chem-E-Car Competition, which takes place from September 15 to 17, alongside the Middle East Process Engineering Conference (Mepec) in the Kingdom of Bahrain. Organised by the American Institute of Chemical Engineers (AIChE), the competition engages undergraduate students, in designing and constructing a car powered by a chemical energy source that will safely carry a specified load over a given distance and stop, says AIChE in a release. One of the main objectives of the Mepec organising committee is to foster the participation of the youth in the process engineering sector. ChemME, the student initiative at Mepec, will aim to provide an engaging, enriching and enlightening experience for graduates and undergraduates in the region. "Mepec is proud to host the Chem-E-Car Competition and a number of other activities designed to attract many students from the region to attend Mepec 2015, to meet with industry leaders and to share ideas amongst themselves," says the release. 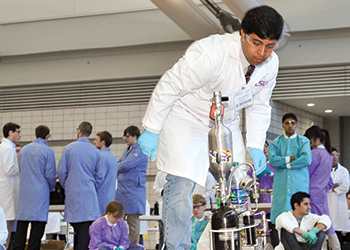 Bette Lawler, AIChE chief operations officer says: "The opportunity to run a regional version of our trademark The Chem-E-Car Competition, alongside Mepec 2015 received high praise and an incredible level of interest from not only a number of committed universities but also by many important industry stakeholders." The Chem-E-Car Competition, which began in 1999, is a fun and practical way for students to apply their knowledge of chemical engineering principles while helping build leadership skills, a keen emphasis on process safety and interest and expertise in alternative fuels. With a growing interest in real-world applications of alternative fuels worldwide, it’s more important than ever for college students to learn about chemical reactions that can move vehicles. Dr Basim Abussaud, Assistant Professor, KFUPM and Student Programme Advisor of Mepec 2015 says: "The Chem-E-Car Competition, is the perfect platform for students to work as a team and come up with a solution with an end goal. KFUPM is a student chapter of AIChE and we look forward to the competition every year in the US. Bringing it to the Middle East has the student thoroughly excited to compete." In the competition, students create load-carrying cars using a variety of materials and fueling methods. The designs showcase the teams’ creativity, with cars powered by Zinc air batteries, hydrogen fuel and even beef liver. The student engineers do not know the size and weight of the load their car has to carry or the distance it must travel until the competition begins. The students then scramble to calculate how to get their car as close to the distance goal as possible. Teams must find a method that is flexible enough to fit a range of payloads and distances, and reliable enough so it doesn’t fail with real world variables (temperature, humidity, track roughness, changes in elevation, etc.). Winners in this competition aren’t determined by whether their car is faster or more powerful, but how accurate their chemical reaction to stop their vehicle is. 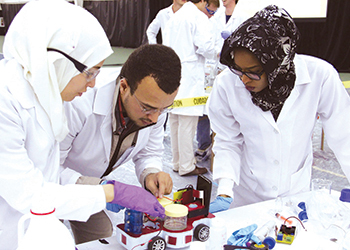 The Chem-E-Car Competition aims to increase awareness of the chemical engineering discipline among the general public, industry leaders, educators and other students and encourages students to become actively involved in their professional society. Mepec provides students and potential employees the opportunity to network and mingle in an exciting environment. Through participation in the competition, teams will also gain access to Mepec’s Student Conference Programme – ChemME, which includes tailored-made workshops, debates and networking sessions. Participating universities include American University of Sharjah, Cairo University, King Fahd University of Petroleum & Minerals, Qatar University, Texas A&M University – Qatar, University of Bahrain. Each University may enter up to three cars. The founders of the Chem-E-Car Competition, AIChE, was founded in 1908, and is a nonprofit organisation providing leadership to the chemical engineering profession representing 50,000 members in industry, academia, and government. AIChE’s vision is to provide value as the global leader of the chemical engineering profession, the lifetime centre for professional and personal growth, and security of chemical engineers, and the foremost catalyst in applying chemical engineering expertise in meeting societal needs.